Winners and Losers: Grey Villet’s sports photography captured iconic images of some of sport's most telling moments. His instantaneous composition of the tableaux as Sugar Ray Robinson, weighed in for a comeback fight against Bobo Olson for the Middleweight Championship in 1955, told a subtle tale. Sugar was considered one of the finest athletes of the 20th century. His entourage at the weigh in included former Heavy Weight Champion Joe Louis, a midget, his manager and more. He hoped that this bout would regain more than the title he had held twice. His glittering lifestyle had cost millions and left him all but broke and in debt to the IRS. He won back the title but the entire fight purse went to pay back taxes. "Its like fighting an airplane propeller whirling past your ear," Archie Moore said after losing his 1955 challenge for the heavy weight championship to Rocky Marciano. "You got to keep low and think". At ringside, Grey's almost instinctive sense of composition caught Moore keeping low and Marciano whirling in another classic boxing image. 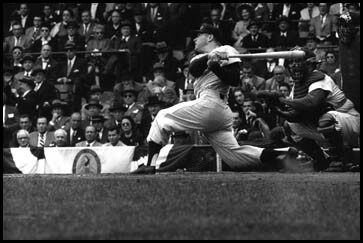 1955 World Series, with two men on base in the final inning of game seven, the Yankees seemed poised to grab victory from the Dodgers. But then Sandy Amoros nixed their hopes with a spectacular catch giving Podres a shut out and the Dodgers their only series championship. 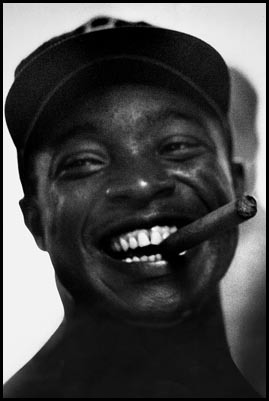 In the ensuing post game mayhem of the lockeroom, Grey caught a jubilant hero with his victory cigar. 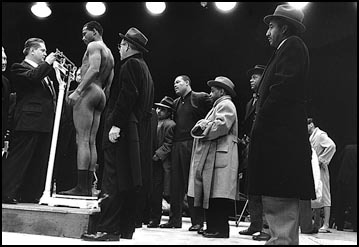 Top left: Sugar Ray Robinson weighs in for a comeback fight in 1955. Top right: 1955 Rocky Marciano batters Archie Moore. The World Series in which the Brooklyn Dodgers bested the mighty Yankees in 1955 remains a classic in the annals of baseball. Its standout heroes were Sandy Amoros, who made an amazing left field catch to end the final game and pitcher Johnny Podres. Grey, only recently arrived from South Africa had had his very first exposure to baseball the previous spring when he was sent to cover the St. Louis Cardinals in at training camp. That artful take won him a place at the World Series where, perched high in the stands with an exotic 800 millimeter long lens and a 70 millimeter high speed camera he caught the essence of the action as Jackie Robinson stole home, the mighty Micky Mantle came to bat and Podres's 7th game win was saved by Amoros in a game winning catch Grey captured on film from far across the field. 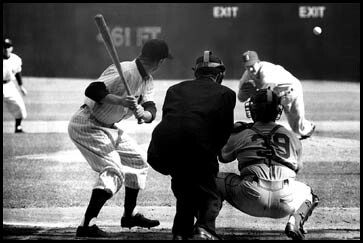 Above: 1955 World Series, outfield Dodger Amoros's left field save gave Johnny Podres' an unforgettable 23rd birthday present: a shut out in game 7 and a storied World Series championship for the Dodgers that even the mighty Mickey Mantle (below) --pictured pinch hitting for the Yankees –couldn’t prevent.